The FEI Nova Nanolab 200 FIB/SEM combines a high-resolution Schottky FEG-based scanning electron microscope (SEM) with a high-energy Focused Ion Beam (FIB) using gallium ions. The system can accommodate circular samples up to 50mm in diameter and approximately 20-25mm tall (the stage has about a 25mm Z-travel). The SEM operates up to 30kV with seven calibrated current levels for any given accelerating voltage. The aperture current levels are set at various accelerating voltages with calibrated currents. 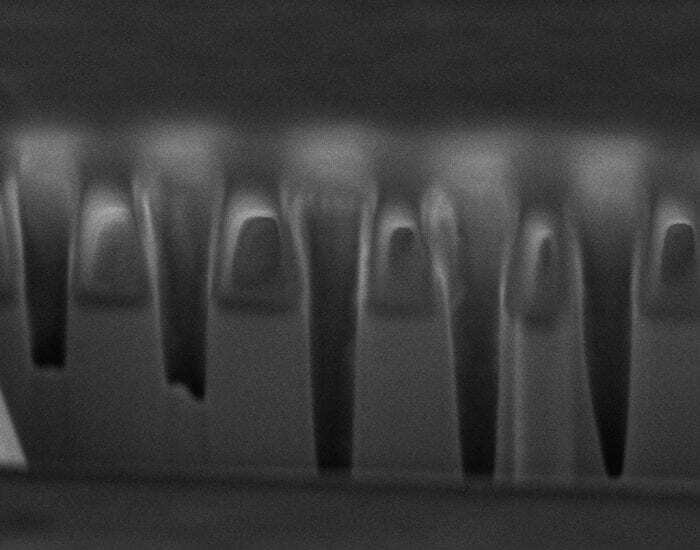 The SEM has an Everhart-Thornley detector (ETD) and an in-lens detector (Through-Lens Detector (TLD)). The TLD can be biased in multiple modes and can provide both secondary and backscatter images. It features an Ultra-High Resolution immersion mode (Mode II) that can yield higher resolution pictures for some types of samples and can be used in four modes (Secondary, Backscatter, Charge Reduction, and Down-Hole Visibility). Typically imaging is done with the TLD. The system has a 20mm EDX detector. To request training or reserve time on this instrument, click here to go the FEI Nova Nanolab 200 FIB/SEM equipment page on SUMS. 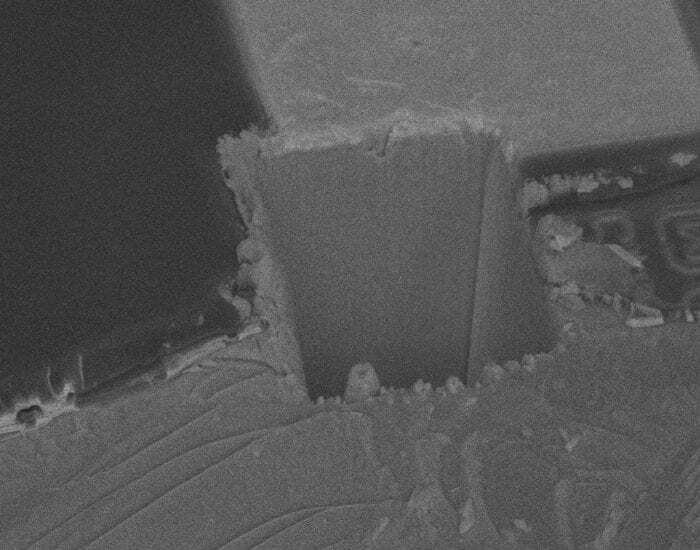 The FEI Nova Nanolab 200 FIB/SEM combines a high-resolution Schottky FEG-based scanning electron microscope (SEM) with a high-energy Focused Ion Beam (FIB) using Gallium-69. The system can accommodate circular samples up to 50mm in diameter and approximately 20-25mm tall (the stage has about a 25mm Z-travel). 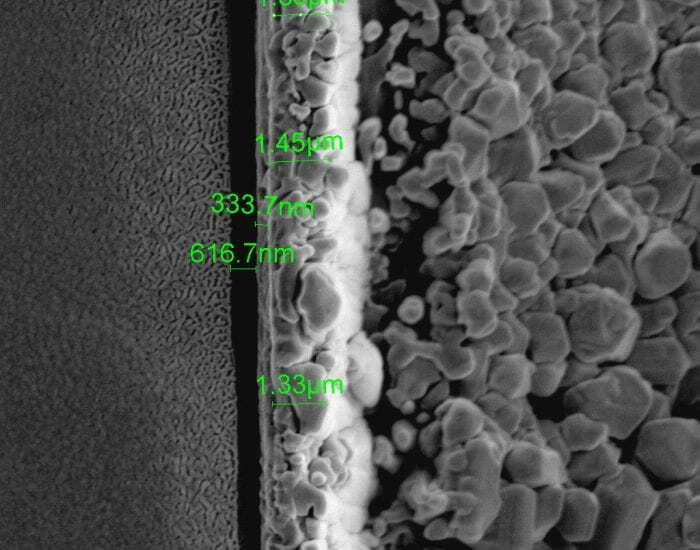 The SEM operates up to 30kV with seven calibrated current levels for any given accelerating voltage. The aperture current levels are set at various accelerating voltages (1kV, 2kV, 5kV, 10kV, 20kV, and 30kV). 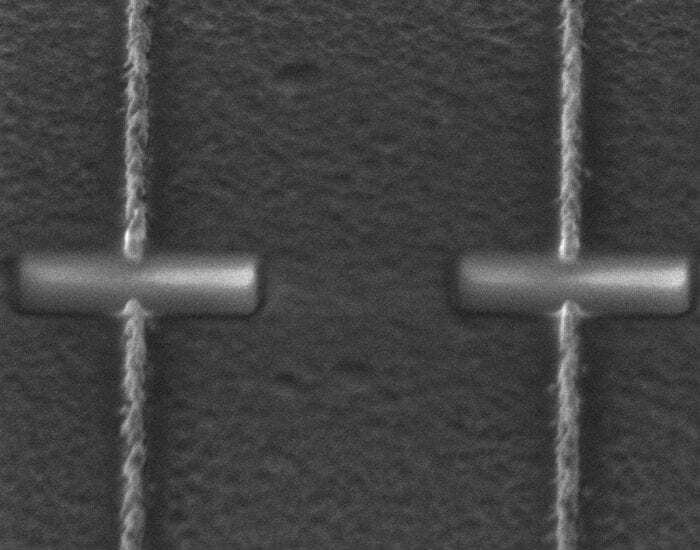 The SEM has an Everhart-Thornley detector (ETD) and an in-lens detector (Through-Lens Detector (TLD)). The TLD can be biased in multiple modes and can provide both secondary and backscatter images. It features an Ultra-High Resolution immersion mode (Mode II) that can yield higher resolution pictures for some types of samples and can be used in four modes (Secondary, Backscatter, Charge Reduction, and Down-Hole Visibility). Typically imaging is done with the TLD. The FIB typically operates at 30kV (operating setpoints 5kV, 10kV, 20kV, and 30kV) and has 13 calibarated current levels. The ion beam is typically used to remove material from substrates (e.g. milling cross-sections or arbitrary simple shapes) and can be used to deposit platinum (from an organo-metallic precursor) locally via needle (so called GIS – gas-injection system). The system can mill bitmaps up to 512 x 512 size in grayscale, although getting optimal features requires optimization. The system does not have a pattern generator. When the ions hit the sample, they generate electrons from the collisions. Those electrons are then used to form the “ion beam” image using the ETD detector. The minimum line width that can typically be etched is 30-50nm depending on the material and beam optimization parameters. 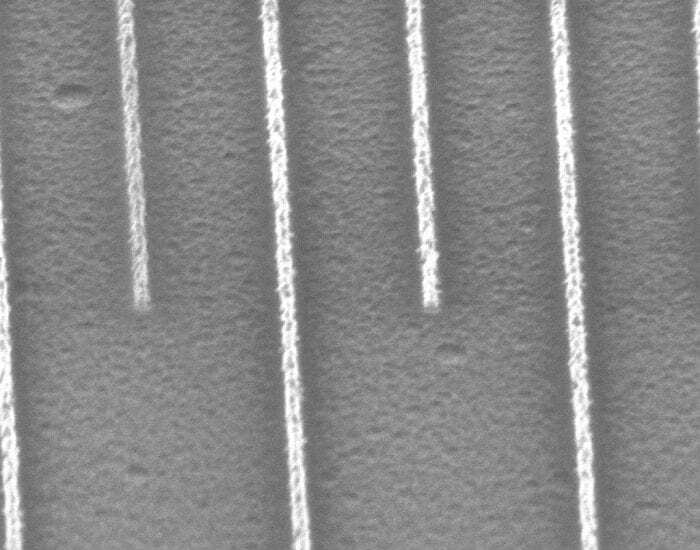 The minimum deposited platinum line width is about 40nm. 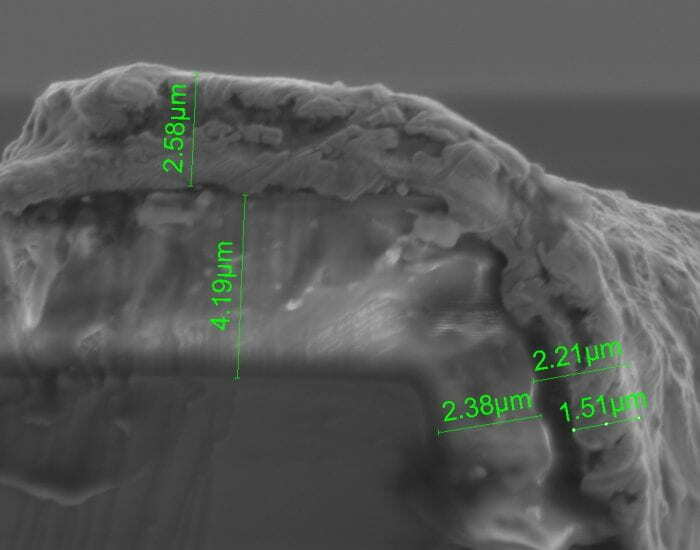 The combination of the SEM and the FIB allows for milling cross-sections using the FIB and imaging the resultant area with the SEM. The system also has EDX (energy dispersive X-ray spectroscopy) for determining the chemical composition of samples and forming maps of surface and cross-sectional composition. 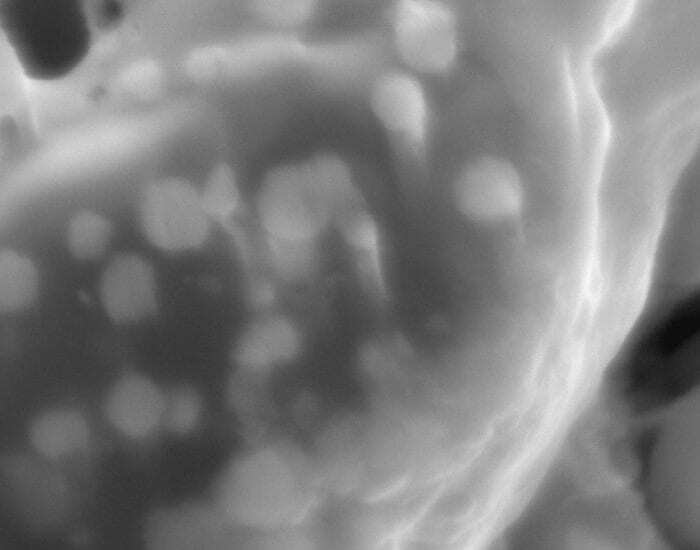 TEM lamellas can be prepared using the FIB and lifted out using the in-situ Kliendiek nanomanipulator. FEI programs called Auto-TEM can autonomously prepare multiple lamellas for liftout. A new Oxford Omniprobe 200 micro-manipulator has been ordered and should be delivered in July, which will significantly automate the lamella process liftout process and significantly improve throughput. 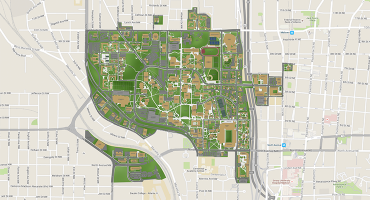 It will allow for some in-situ electrical testing. 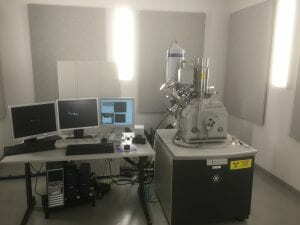 The chamber has electrical feedthroughs to allow for in-situ characterization. 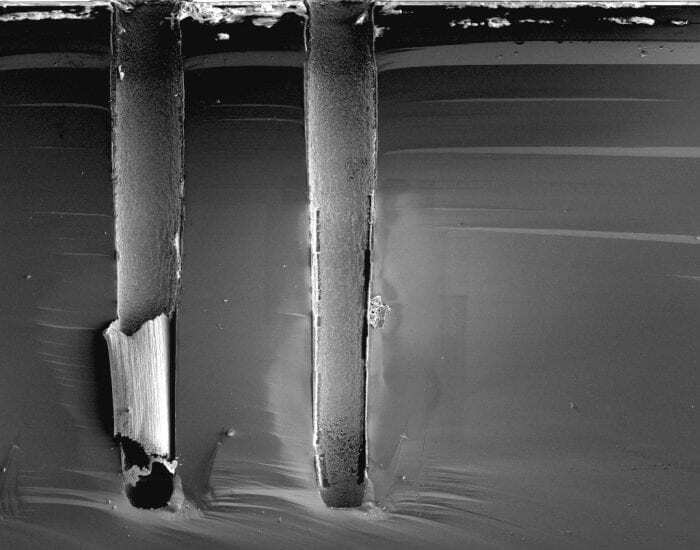 Several professors have used this platform for their work, including in-situ tensile testing. Typical applications include materials characterization, structural testing, photonic device prototyping (via bitmap), and circuit editing. The staff has extensive experience with various applications and provides regular, comprehensive training on the instrument.